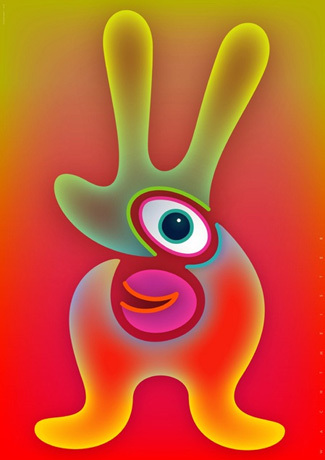 In an AD Mag Exclusive, AD Mag present the wonderful artwork of German artist, Bernd Wachtmeister. AD Mag thanks Bernd for sharing his work with us. As well, for AD Mag readers, be sure to visit the home page of the artist, by clicking here. Recently, Chris Ashley and I had a chance to chat; a dialog that turned out to be quite engaging. But first, before we launch into that conversation, AD Mag presents a mini-gallery of Chris’ images, which have been “hung” in a similar curatorial style that he uses when exhibiting his own work. That presentation style being that his work is often shown in a rather methodical, sequenced way. 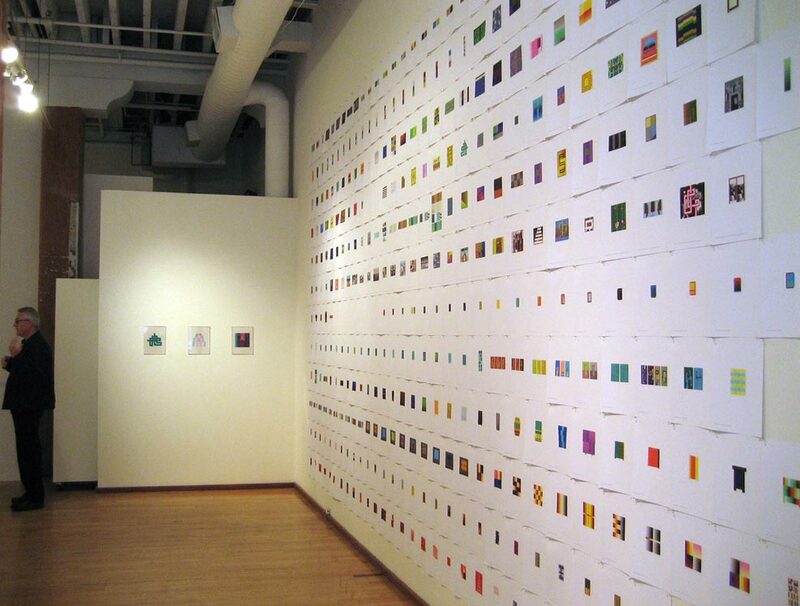 In this instance — here — the work(s) below represent the 12-month calender cycle for last year — 2008; each piece representing a different month. 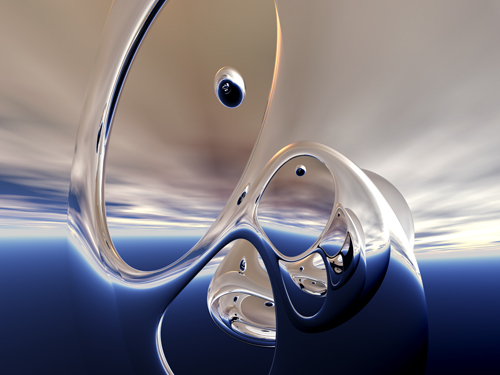 Everyday, for the last several years, Chris Ashley has created a new piece of digital artwork. 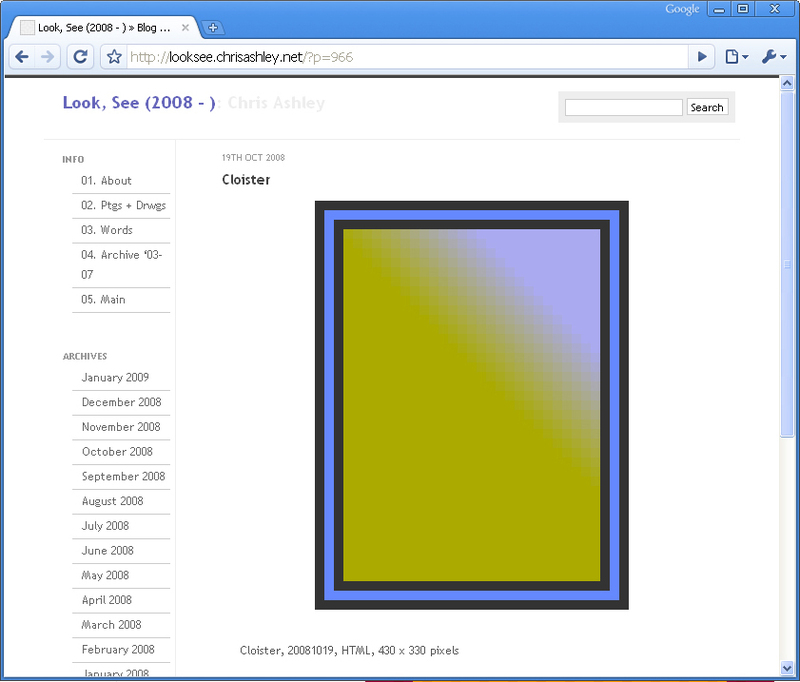 And unlike almost all other artist working in the digital media realm, where some sort of patented software is used as a virtual pallet, Chris Ashley is quite different. 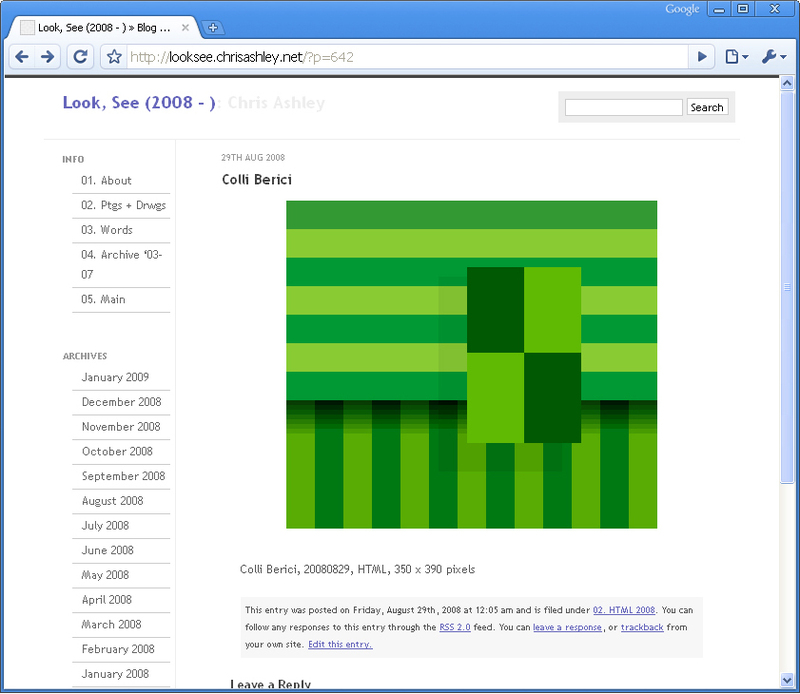 He paints with HTML code; a process that is better known for creating text &not artwork. Primarily, this being because of the inherent HTML markup limitations. What follows below is an online interview that took place in January 2009. Max: I’d like to start by getting some background information. How long have you been an artist? Chris: Typical story: drew all the time as a kid; was praised in school for talent and interest; in high school I gravitated towards art classes; a few key people encouraged me. Starting college I thought I’d go in the direction of journalism, but that only lasted one quarter. I started painting in high school, have always drawn, have always looked at art, have always had what I think of as an artist’s attitude and outlook. There have been periods of my life when production increased and decreased, or when my participation as an artist in an art world, or the art world, or an arts community, has risen or fallen. My core identity as an artist, I now know looking back, has been with me since I first recognized the pleasure that stacking blocks, organizing objects, pencil on paper, color, light and seeing can bring. You and I are going to talk here about my HTML work, but I also make paintings and drawings. Although they initially look different there is a single sensibility at work. Work in various media all carry the same weight for me, and are part of my larger body of work. Max: How do you define art? Chris: There are a lot of people who are smarter and more knowledgeable than me who have worked this topic over quite a bit and I don’t think I’ve ever read a good definition, so there’s a part of me that wants to ditch this question. And I think this topic requires a much longer conversation than we can go into here; the same way that the back-and-forth of a conversation might help exploration of the subject may be similar to how one engages with an artwork, so I’m not that interested in, or even qualified to, lay down some definition. But I think the “art” in an art work has to do with a physical, emotional, cognitive, intellectual, and sometimes social response via a visual and physical engagement with an object and its materials. There must be a conceptual basis that provides a foundation, context, or framework for how to understand the object’s imagery, tactile qualities, scale and size, and the way it’s displayed. 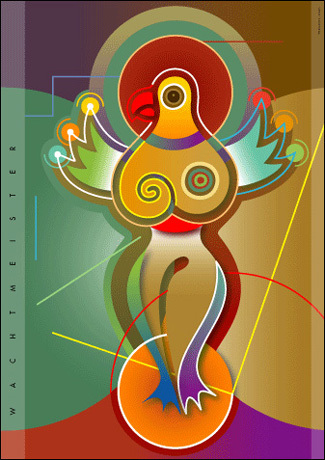 This conceptual basis must be evidenced in the artwork and sought and recognized by the viewer. I think the art object should show an awareness of history, and I think the art must be found with a minimum of explanation, though the art may demand that the viewer come to the work informed. An informed viewer is a responsible member of the art community; it is not the art object’s responsibility to be accessible to the viewer, though it does have the responsibility of not being inaccessible. I don’t think art is literature, sociology, psychology, politics, journalism, cultural critique, advocacy, or research; though art may employ any of these fields. Art is not simply an idea, a process, a relationship, an interaction, or documentation. Without being powerfully visual I don’t think anything that is called an art work qualifies as the kind of art we’re talking about: fine art, visual art. The word beauty and taste should come in here somewhere, but I’ve found discussions like that to be quagmires. So, not much help from me. What is art? Classic answer: I know it when I see it, I guess. I’m not being much help here. Maybe I don’t know how to talk about it. Max: Philosophically and/or metaphysically speaking, what role do you think art plays for individuals/communities? Chris: Again, another big question. The role of art changes over time. Giotto’s Scrovegni Chapel was not necessarily made for me, someone living in the twenty first century, though I can try to put myself in the shoes of a fourteenth century Paduan and imagine the power of the images and the artist may have intended to convey, but that’s not quite good enough. Fortunately, Giotto’s art is able to function for me as images with which to engage in the discovery, recognition, and appreciation for more human qualities—fear, love, longing, hope, desire, pride, sorrow, joy, regret, relief, peace—than they are about getting into Heaven or keeping me from going to Hell. I would say that I am much more interested in art’s place in individual lives first, and then in how the art is a point around which individuals form communities by sharing understanding, behavior, rules, expectations, but also how art is about or provokes the opposite of those qualities: misunderstanding, misbehavior, breaking rules, failed expectations. That last part is actually a lot more interesting-rupture, confusion, questioning- than the former, though neither could live without the other. Max: Do you see a difference between “graphic art and “fine art:”? 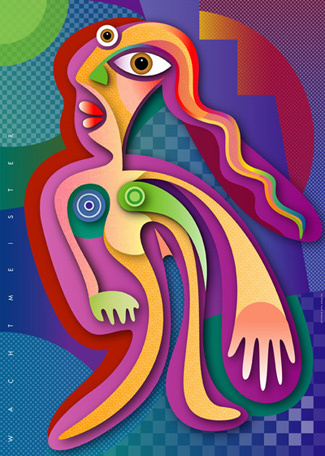 Chris: I see a lot of what I think is graphic art being too easily accepted as fine art. I’m not sure what more I want to say here without sounding judgmental or unkind. This rubs up against the question about defining art. I do think that the easy accessibility of cameras and helpful software is making for a lot of “graphic art” art, both good and bad, but I don’t see much more better or good fine art coming out of these tools some, but not much. The art is not in the tools or the medium. There are a lot of bad paintings that don’t have much art in them, either. Max: Traditionally technology and art have had clear lines of delineation, however with the emergence and proliferation of digital technologies, that line seems considerably more blurred? Agreed? Chris: Actually, I think art has always employed much of the technology of its time, so I’m not sure I would agree that there has been a clear delineation. For example, the steam engine: although as far as I know no artist has used actual steam engines to make art (not considering Jeff Koons’ recent proposal)—so there is that kind of delineation— when the steam engine was new it was a subject or character in many art works. Perhaps more importantly, the steam engine played an important role in Impressionism by making possible artists’ travel to places previously more difficult or time-consuming to get to. Trains took the French plein air painters out where they could paint on-site; that was something new, and one could make similar arguments about automobile or air traffic. The presence of technology may not always be overt in the art. The influence of photography and television on painting is by now pretty self-evident, and it’s quite likely that future historians will see even more subtle ways that the Internet, especially the web, has and will have on contemporary life, including approaches to art. Digital technology of the last fifty years has been less visible in fine art as a tool, yes, and it is becoming more used, but I’m not sure this could be called blurring some line between the fine arts and, say, engineering and coding. Carl Andre was not a Bricklayer-Artist, if you know what I mean. In my attempt above at avoiding defining art I talked about the artist’s choices and concepts and the importance of the visual; I think that’s where the art will be found. Applying the word “art” to other fields, or broadening the definition of art to include other fields is very problematic. I don’t want blurred boundaries; I want delineations. I want architecture over here, and engineering over there, and I want art to stand alone. If one of these fields needs the other for a particular project that’s fine, but to want to be an engineer-artist, or even a digital artist, seems to me to not be clear about what art can do. You can’t have it both ways. If you want to be a hyphenated artist—say, a Software Developer-Artist—then you’re not an artist, and probably a crummy software developer, too. I’m going to draw that line; lots of people will argue about that one, but I’m not buying it. Max: What do you think about the TADAE creative subset? Chris: I didn’t know what this is, so I searched for the term, and it turns out it’s your idea: Traditional And Digital Artist Engineer. I think I understand what you’re trying to define, and you’ve certainly put a lot effort into defining it, but this isn’t something that I feel I can discuss or add much to, and as my previous answer shows, I’m not that interested in the subject. Max: And about HTML, I think I have a clear understanding of how it’s done – how you draw this way. But for those who are unfamiliar with digital language (as it were) could you help that crowd, by providing a simple explanation of your protocol? 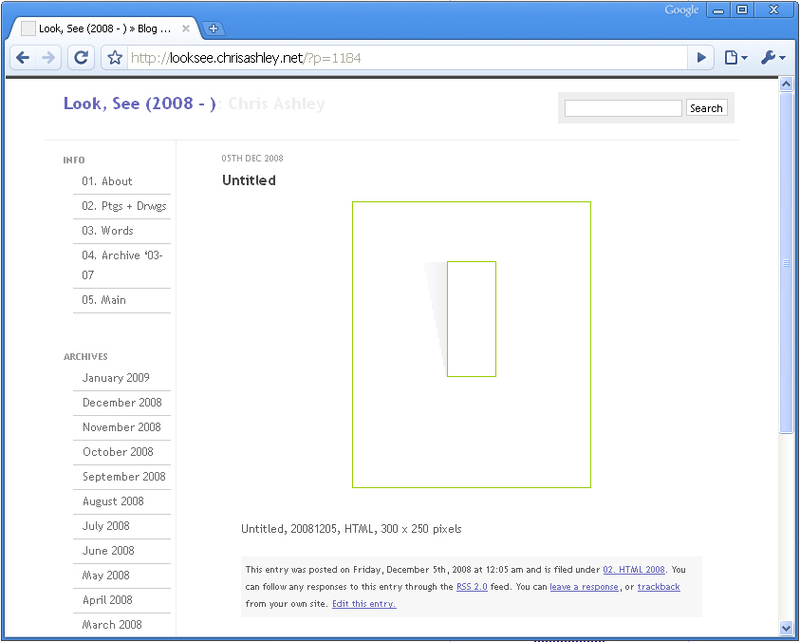 Chris: I use HTML tables. The set of tags used to make the tables is pretty simple, and anyone could learn it in a few minutes. Tables are now a practically deprecated set of tags; they’re not used much anymore. Tables consist of rows and columns, making cells. Each cell can be colored with hexadecimal code. To put it simply, I’m coloring cells in a grid. I make the tables do things they were never intended to do. 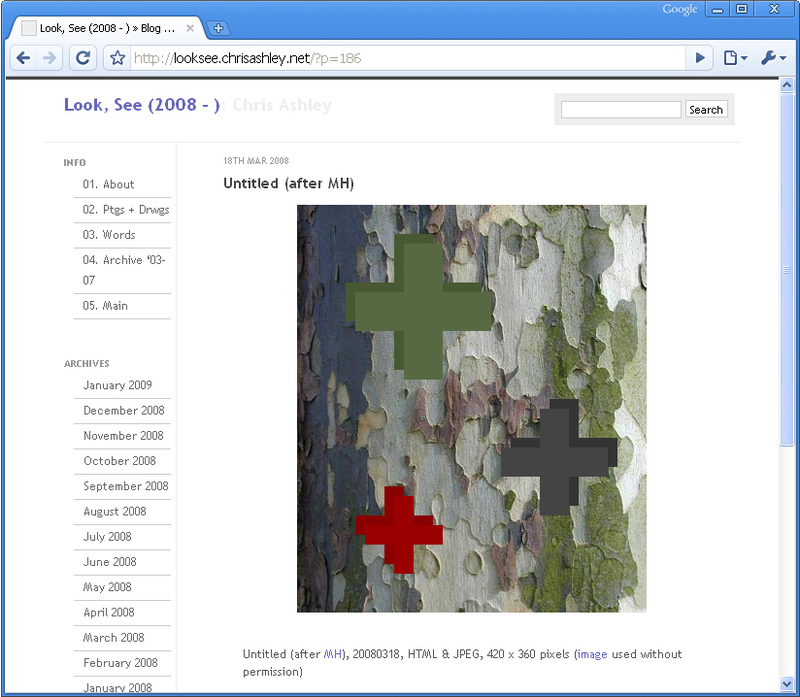 The tables remain as code, and when they are delivered over the web to and rendered by a browser an image is displayed. But it’s not an image; you can’t right-click and save as a JPEG. There’s no image there; underneath it’s all text. They don’t print. They’re lightweight and portable and can be seen by anyone anywhere on the web. I could hand code these, but they get very dense and hard to manage, so I use a very old copy of Dreamweaver, one without all the features, to make these. I call these drawings, not paintings. Drawing is a much more flexible term: tape on wall, stick in sand, finger on steamed mirror. Paintings, for me, require paint and physical presence. 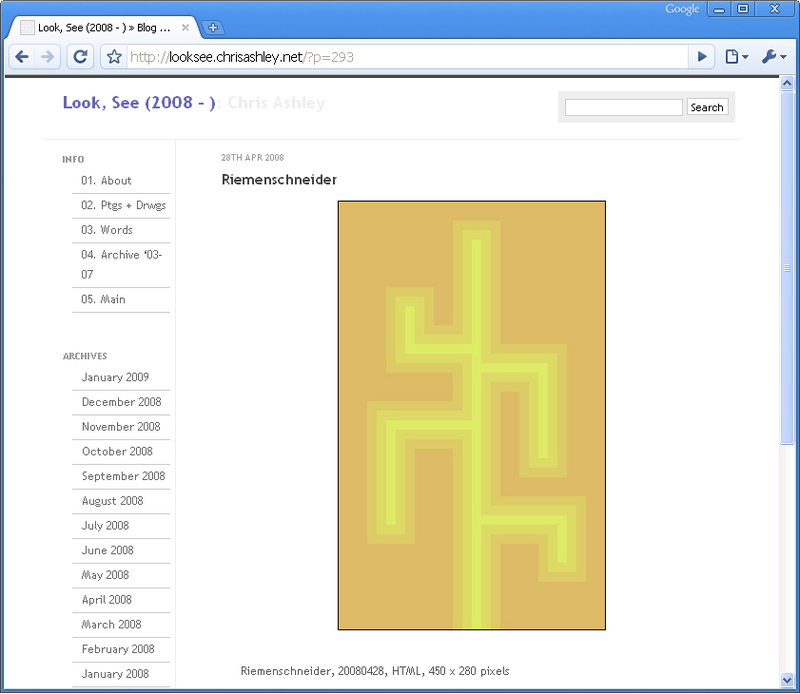 The HTML drawings are grid-bound– the grid is inherent in the medium. I spend a lot of time working against that grid, burying it, putting tension and interest into the image so the first thing you don’t say when you see it is, “Grid.” I don’t want the images to be labeled “hard-edged” and “geometric” other than as latent descriptive terms. The drawings are shown one each day on a blog, everyday, where they accumulate chronologically. 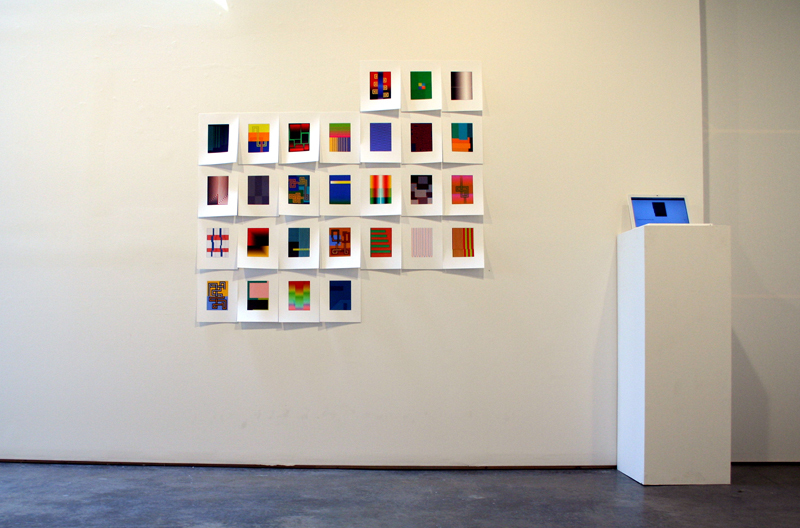 Work is grouped in monthly themes, motifs, or palettes. 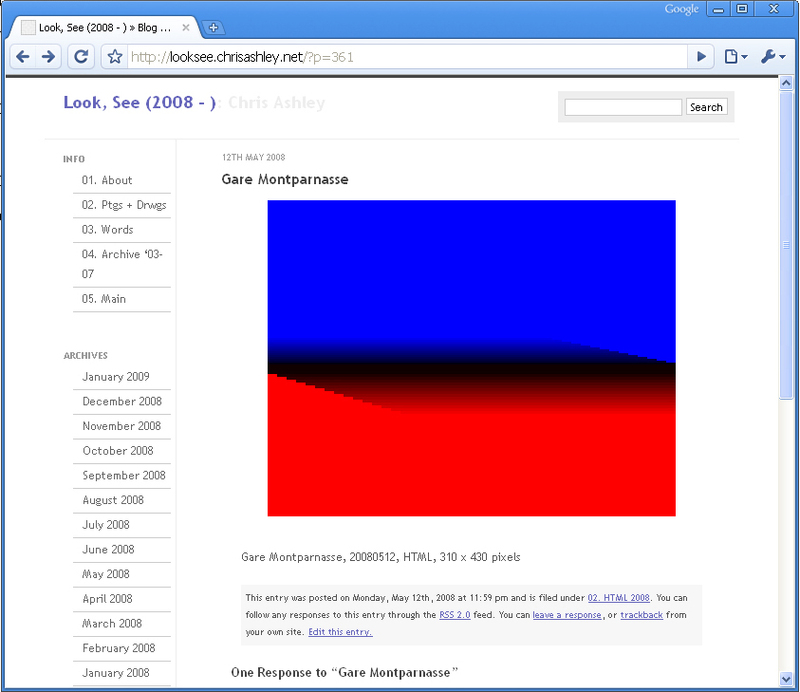 The blog is the primary context for this work. Additional meaning, which I think a lot of people miss, is in this day-to-day performance of posting an image on the web. About three years ago two Serbian artists who work under the name Manik wrote a fairly long essay about my work which clearly pointed out the performance aspect of posting work daily. In addition I sometimes will focus in a series on using JPEGs found on the web as backgrounds for the table, and I “draw” on top of this. My goal with this is a kind of intervention meant to formally enhance the image and, sometimes, deepen its given meaning, as well as creating another layer of meaning on top of that image. In one month’s series I used timed and sequence animated GIFs I made in order to introduce movement; some of these were successful, but I’ve never repeated it. While the images I make appear “abstract,” there’s actually a fair amount of real-world reference in the images in terms of form, space, color, and a sense of gravity in the composition. Like many artists I like walking the line between abstraction and representation, and occasionally I’ve crossed that line a bit towards overt figuration, sometimes quite explicitly, and then I feel free to go pretty far right back across that line to abstraction. In order to show them on a wall, in the gallery context, I produce the images as inkjet prints and show them in groups, typically arranged as the shape of the month on a calendar, the same month during which they were made. 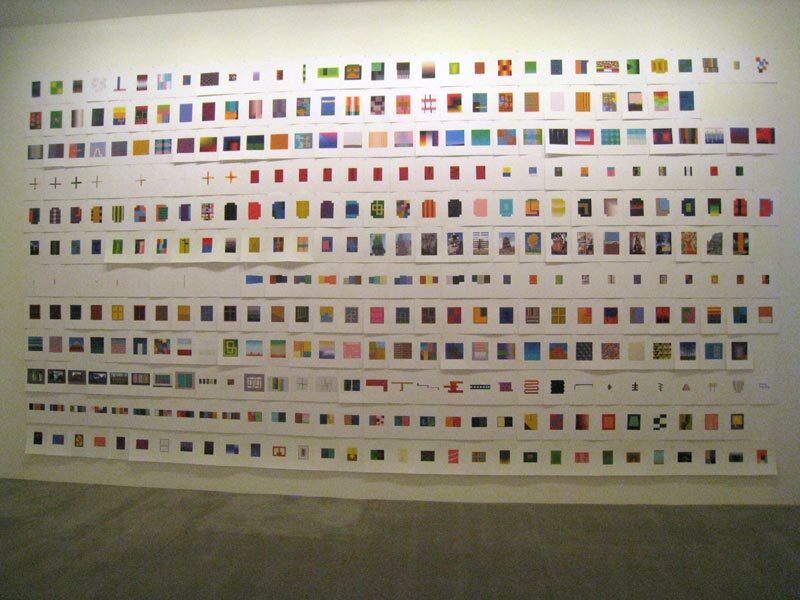 Three times I have shown an entire year’s worth of drawings, all three hundred and sixty five; these are titled, surprisingly, “365.” I only print them on 11 x 8.5 paper, and I often show them simply, unframed and pinned to the wall. It’s important to me that the object carrying these images and how it is shown is as basic, inexpensive, humble, and dumb as the code that originally made them. 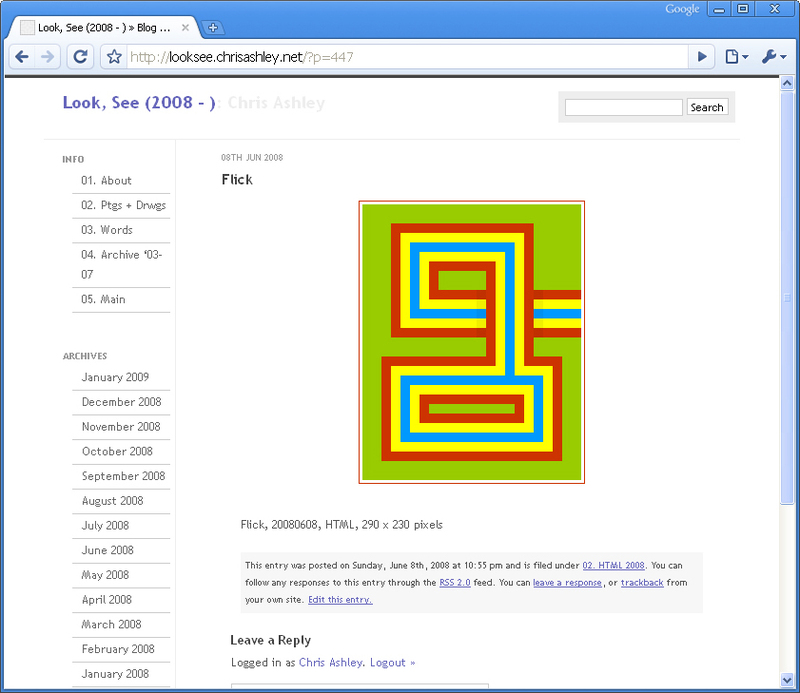 Max: As well, if I understand correctly, you create a new HTML drawing/painting everyday? Is there a back-story that you’d like to share about how that came about? 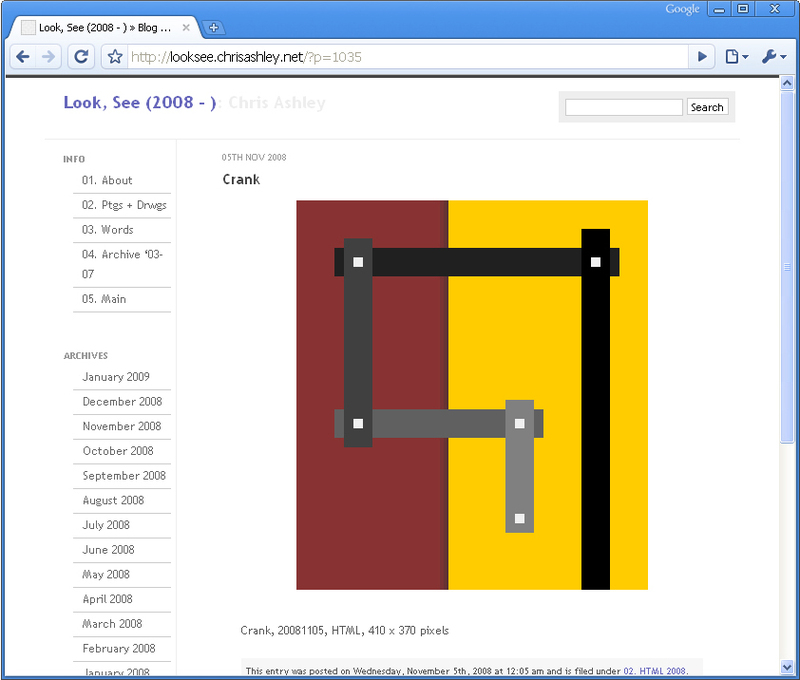 Chris: I started exploring blogs in 2000 as a possible writing and collaborative tool for educational technology for K-12 teachers and students, a field in which I worked at the time at a university. I realized early on that the practice of writing and attracting and maintaining an audience requires regular, reliable, fresh content, so I developed the habit of regular posting. Because I’m an artist, at some point early on I wanted to bring art into the blog. Although I know these tools well, I did not want to get into Photoshop and FTP and all that; I had no interest in making JPEG drawings or whatever, and I can see how easily making images with sophisticated tools can get out of hand. I mean, how big of a box of crayons do you really need to make something meaningful? I find Photoshop to be kind of a trap; it does all of these cool things, and before you know it, it looks just like someone else’s fooling around in Photoshop. It occurred to me that tables could be used for more than placement or layout, which was actually their original purpose. I started occasionally making very minimal images as a lark—two squares side by side or one inside the other; a ladder; a simple face. After a few months the art took over the blog from the educational content, and slowly the images became more complicated. Within a year I realized that this could become a viable medium, but at the same time it was so dumb and basic it was almost embarrassing. Here I was putting this out in public everyday; as one friend put it, I was, “playing with colored blocks.” Every once in awhile I’d think, “OK, that’s it, you’ve gone as far as you can with this,” but I’d find one more twist: an effect; a way to mix color; a way to tweak the grid. I made the first drawing in summer of 2000, and now here it is 2009; that’s a lot of drawing everyday. A handful of people who saw them on the web early on recognized and valued what I was doing, saw that the images were good and that the overall enterprise went deeper than that; I’m grateful to those few people for their early understanding and encouragement. Invitations a few years ago to show these images forced me to think about how to move them out of the blog and into actual space in a way that I felt maintained the integrity of the overall project, and at the same time figure out how to make them saleable objects. I’ve really appreciated those opportunities. 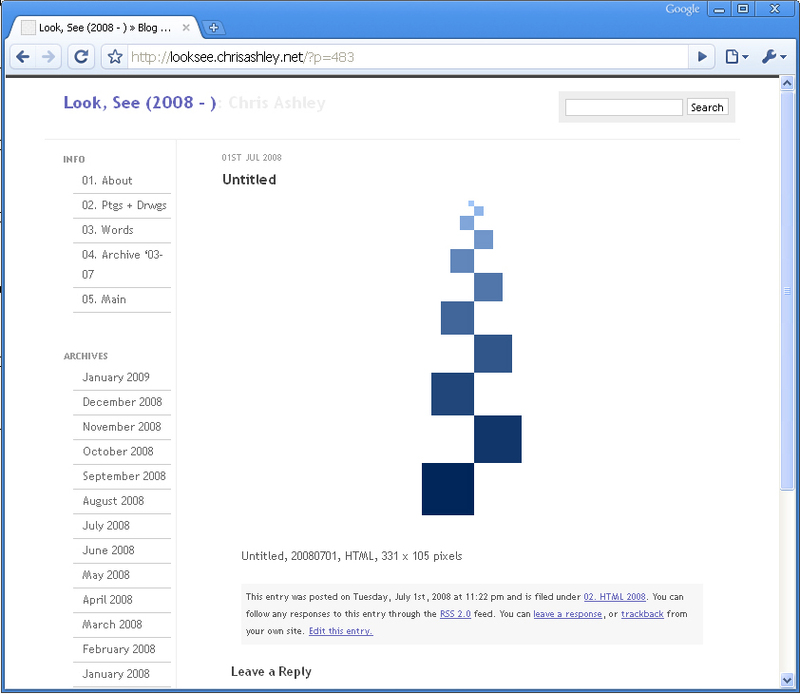 The HTML puts a lot of constraints on what I can do: no diagonals; limited color; crisp edges; browser-scaled sizes, etc. However, I have found these constraints to be both enormously freeing and good things to constantly bump up against. It forced me to make something out of a really small box of crayons. Some time back in the 70’s I read a critic (I think it was Peter Plagens, but I’ve never been able to confirm this) say something like, you know, the really good artists can make something great with a #2 pencil and an 8.5 x 11 sheet of typing paper. The idea was you don’t need expensive materials and a twelve foot square canvas to make something serious and meaningful. That idea has been pretty important to me ever since. Max: In your mind, your opinion – has digital art reached a point where one might attempt to call it mainstream? Chris: Well, art itself isn’t even mainstream in society, really. You know, you see it all the time- I know this sounds arrogant or exclusionary, but only a small minority of people really know how to look, and from that feel and think. If you mean the art world mainstream, sure, the art world is typically open and big enough to consider a lot of different things as capable of being art. 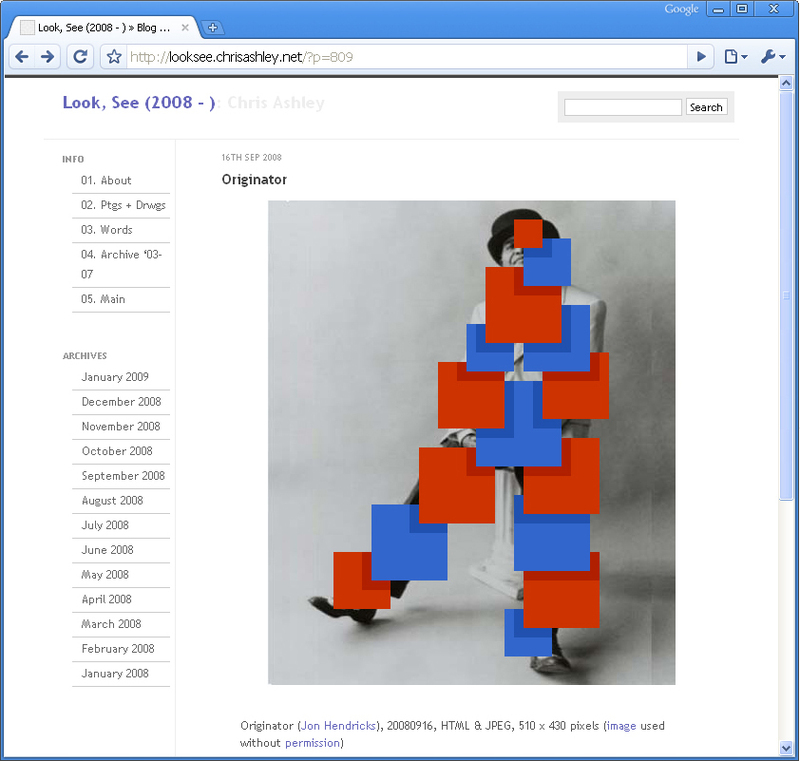 Max: Any ideas about the future of art – digital art? Chris: I’m just an artist. I don’t make digital art, and I don’t really think about digital art, per se. There are artists whose use of various technologies is very interesting, very personal, and perhaps even quirky. I’ll just name a few people who I think made good art; most of these are all people with whom I’m slightly acquainted, probably because our work tends towards the more handmade or low-tech, an inclination I would guess probably has to do with more than a little skepticism about technology and its tendency to dominate: Tom Moody, Joe McKay, Marisa Olson, Cory Arcangel. I think Sally McKay and Lorna Mills are routinely doing very interesting things on their shared blog. That’s a small selection off the top of my head, and I’m leaving a lot of names out here. All of these artists make art, not digital art. I don’t mean to sound contrary, but to put it very simply I don’t think there is a future in digital art, but rather in art that is made in various ways. 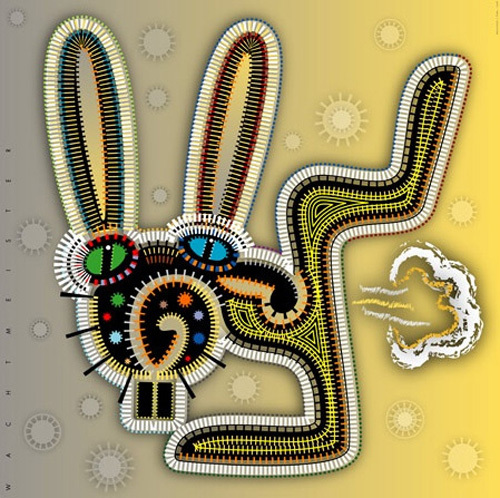 Max: It is my observation that a certain stigma exists when it comes to the semantics of applying/affixing the word digital, and by proxy thus implying whatever cognition one has of that word, to the word art. With the subjectivity of one’s experience being kept in mind, would you care to share any thoughts you might have on this seemingly cursed (if you will) issue; if in fact you even consider it an issue at all? Chris: The stigma for me about the term “digital artist” is the possibility of being typecast via a label which then allows someone to think they understand me and my art without fully engaging with it. You can flip through any art history book and find a lot of labels, and when you read the literature you often find that the artists to whom those labels are attached vigorously, even violently, eschewed the label. I can’t recall any Abstract Expressionist who claimed that label. Pop Art, Minimalism—those are slippery labels. They’re historic terms, really, applied to a period and an outlook and way of working, but these labels leave a lot of other things from that period out of the picture, and don’t fully take into account what came before and after. Some artists called themselves a painter or a sculptor, but not painter-artist or sculptor-artist. I find that even just telling someone that I’m a painter usually sets in motion a whole bunch of inaccurate assumptions. It could also be that in the marketplace there’s some kind of hierarchy, with painting at the top followed by sculpture, drawing, installation, or whatever. Prints and digital art are kind of low on that list. Perhaps simply using the term “art” is a way of leveling the playing field. I think one general bias about what is being referred to as “digital art” is that somehow software makes the work for the artist, that there is some automation or process that the artist engages by simply pushing a button. Another bias is that digital art isn’t really original; I mean original in the sense of one of a kind or limited edition; potentially, a digital image is infinitely reproducible. That’s a problem in the marketplace. But mostly I think that the “digital” art I like works against the technology, even attempts to corrupt it or make it do something it’s not supposed to do, all in service to the artist’s concept, subject, and meaning, and while remaining open to the viewer’s experience and associations. Max: We come to the end of the interview. So Chris, on behalf of the readers of AD Mag, I want to thank you for taking the time to share your art and intellect, in what has turned out to be an engaging and enlightening discussion. 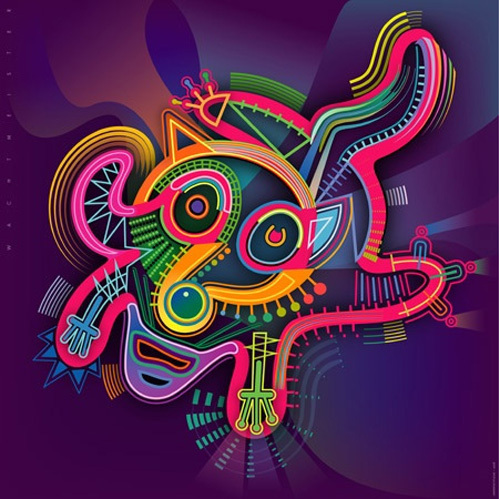 As well, please be sure to check out more of Chris’s work in the AD Mag Artist Galleries. 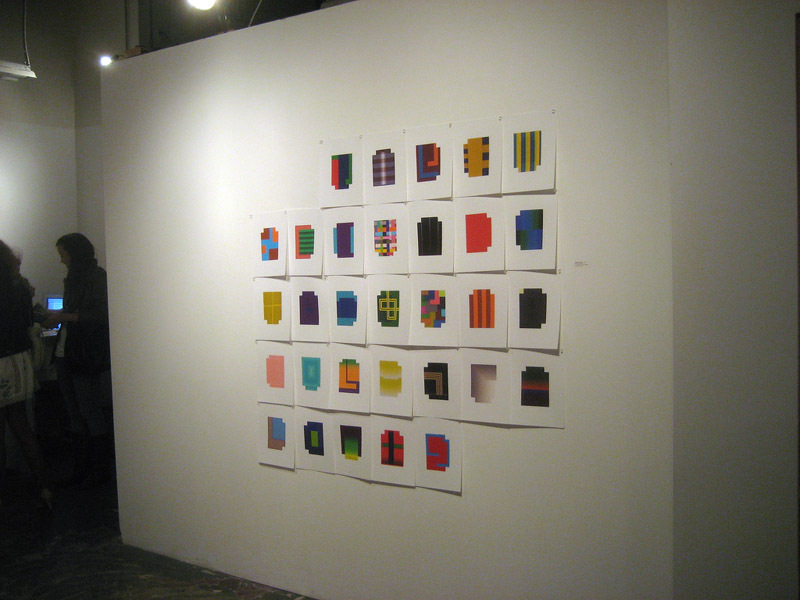 And in closing,we leave you with a few views of Chris’ work, as presented — digital prints on paper — in 2007 – 08. So Masha, how long have you been an artist? Since I can remember, art has been an essential part of my life; when I was a little girl I already consumed loads of paper, paint and crayons for my sketches, drawings and paintings. My sister teased me ,telling me she might probably have to become a Greenpeace member in order to compensate a bit for all the trees that had to be chopped down because of my paper consumption. My delight in painting has not developed by chance: my mother is a well-known Russian painter and so has supported me as good as she could. At the age of 13 I entered the Saratov Art School founded by Bogolyubov. I finished my studies after some terms abroad in Switzerland and got my diploma in Saratov. It was also in Switzerland that I got familiar with computer graphics in 2003. From the very beginning I have only been using Illustrator, and I have never really considered working with a different programme. Concerning my illustrator skills I would say I am a self-taught person because I have never done a computer course or anything like that. It was pure “learning by doing”. Possibly that is why my illustrations seem a little unconventional. Who would you say are some of your favorite artists? Yes, there are some. In the childhood I liked Hieronymus Bosch, Aubrey Beardsley, Alfons Mucha. Now there are a lot of contemporary artists, watercolorists but I don’t remember their names. Most likely I choose several pictures for myself where I like the idea and the giving – it may be even a part of a photo, then I create the feeling like I feel looking at them – the model, the principle of giving, which I saw in the vector shape. I understood for myself that the world of an artist may be contaminated into strokes and they may depict everything and in a very naturalistic manner. That is the question of a personal restrain – which is necessary to be resist. I try to do so – I mean, to be speedy in some actions, but this is not the question of a day. And, how would you describe your work? I have never paid any attention to the question of style. What would one call my style? Perhaps others might think of a term for what they are creating. Concerning my work there are elements of fantasy and comics for sure, but I dislike categorizations or putting people into certain groups. That is what bookkeepers might be keen on, but not me. Honestly, I don’t care about what is going on in the vector community, either. I don’t read blogs or tutorials or anything of the sort. As for me, people there talk too much about technicalities, styles and tricks; that is only about tools. It has little to do with creativity, but never mind. Everyone should do what they like most and what is fun for them! I couldn’t agree more. There is way too much attention given to the machine, but ultimately it’s the human behind the machine that comes through. 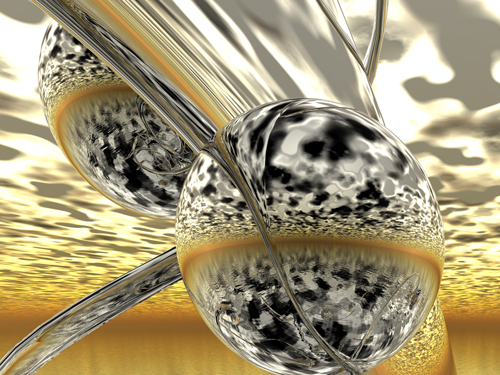 Now, in your opinion, what is the future of digital art? 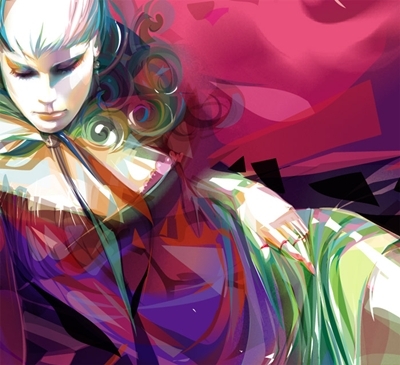 Digital art takes already a major important place in all ranges of art. And I think, it will be increasingly important – if people some day realize, that not the computer makes the artwork, but the artist behind! The computer is only a tool, not more. It’s like in the authorship: the programs for writing – like Word or so – don’t make the stories. It’s the author and his creativity. And in digital art it’s the same. Maybe “digital art” is a wrong term: “art made by digital tools” would be better. Even the computer is very important. From year to year this machines – or better: the software – have more possibilities, makes the handling easier and give artists more freedom and facilitate the creativity. Masha, thank you for your time. It’s been wonderful. 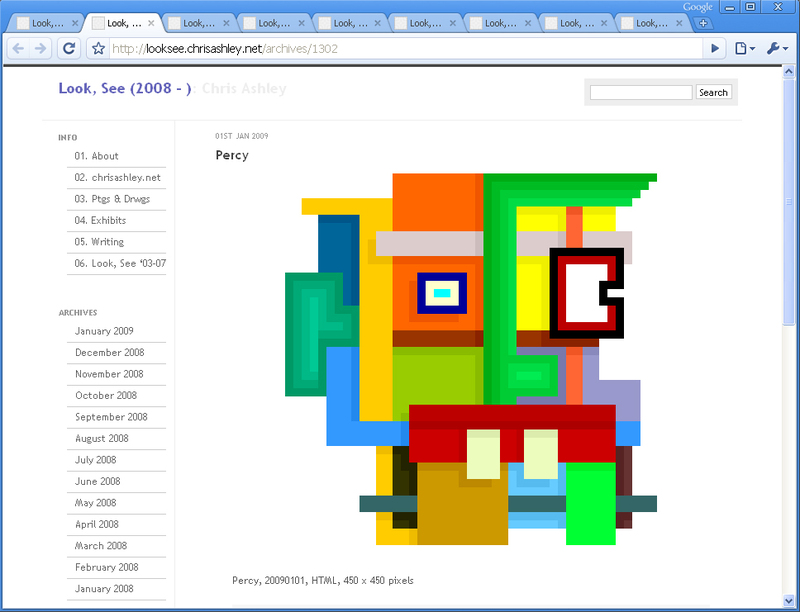 Everyday, for the last several years, Chris Ashley has created a new piece of digital artwork. 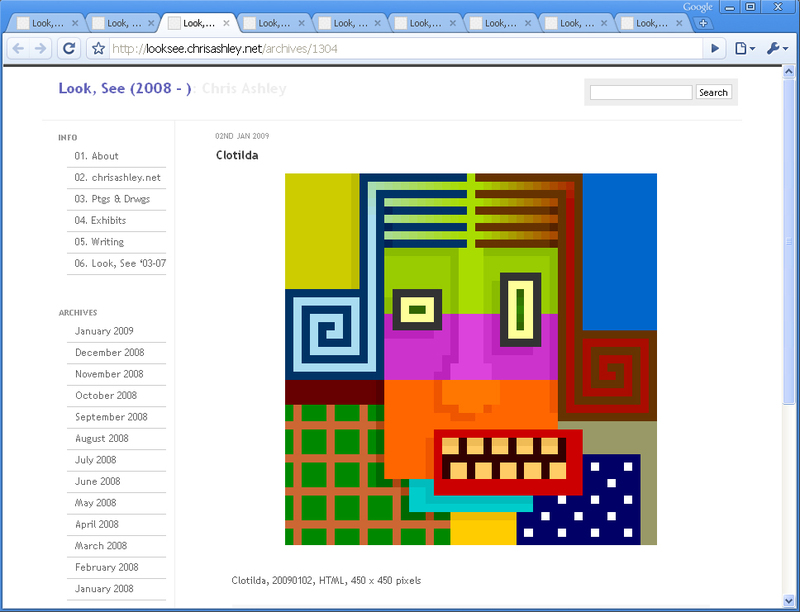 And unlike almost all other artist working in the digital media realm , where some sort of patented software is used as a virtual pallet, Chris Ashley is quite different. 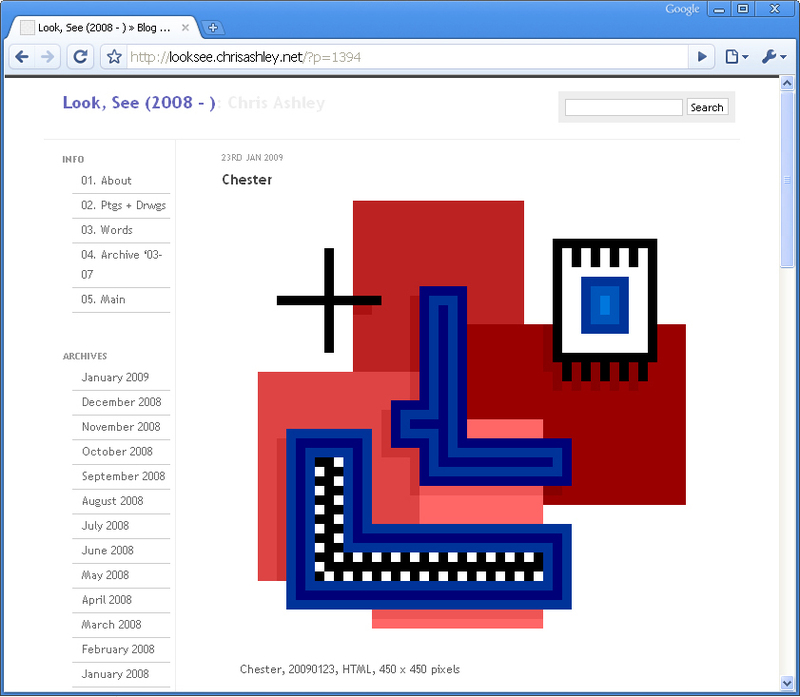 He paints with HTML code; a process that is better known for creating text…not artwork. Primarily, this being because of the inherent HTML “markup” limitations. This is really about making images, not about software. Color is painterly- conventions like mix, tint, shade are emulated and used for structure, space, and composition. It’s all quite a bit more involved- intuitive, hand made, felt- than it might initially sound, which will be borne out by looking and seeing. 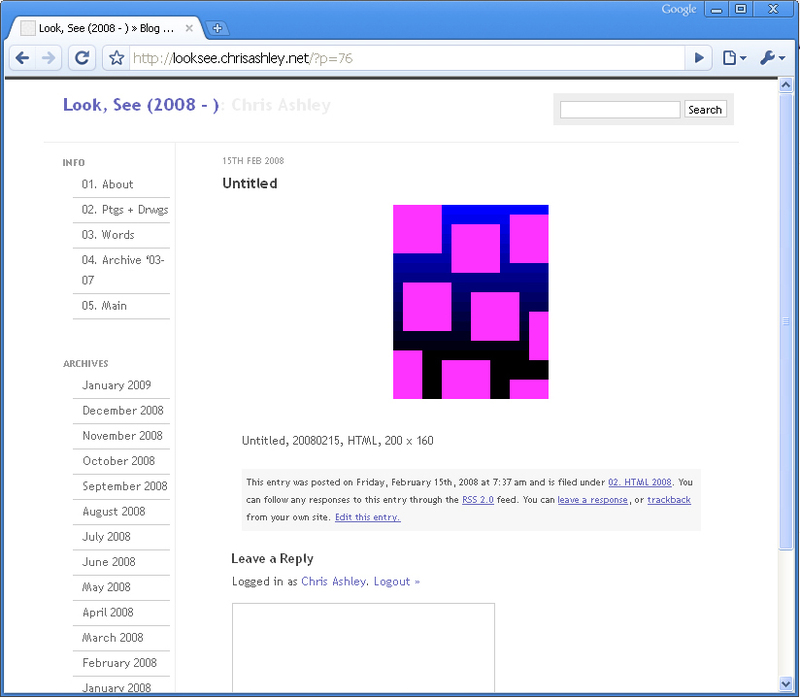 Visit Chris Ashley’s website. 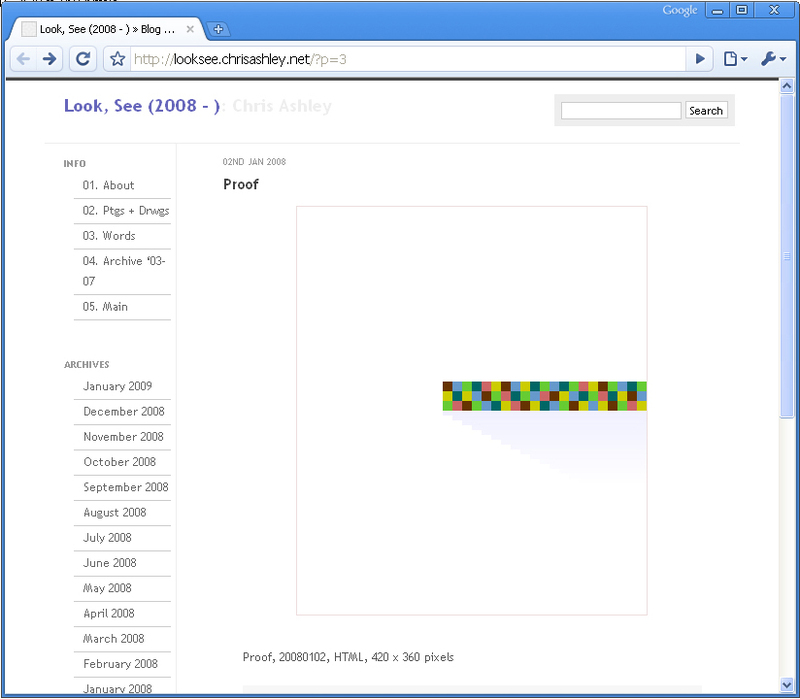 Then later in the month return to this site to see more of Ashley’s work and hear more of what he has to say. I know I’m looking forward to it. 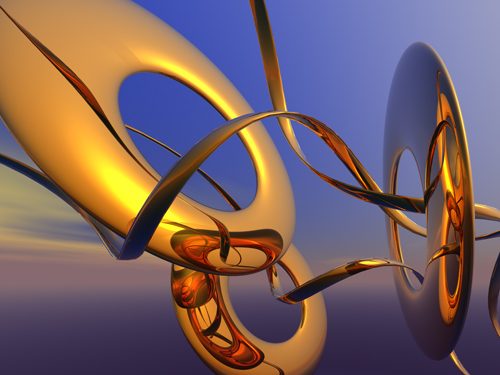 Scott Piers is a highly talented, digital artist who creates lyrical compositions of 3-d abstractions that seem to suggest dynamic, kinetic movement. And though he’s no stranger to the liberal usage of color, in his work, one finds that he often uses monochromatic pallets with elements of “light” reflection – adding a bit of fantasy and surrealism, which I’m inclined to described as non-local cosmic projections. Scott: Thank you Max. 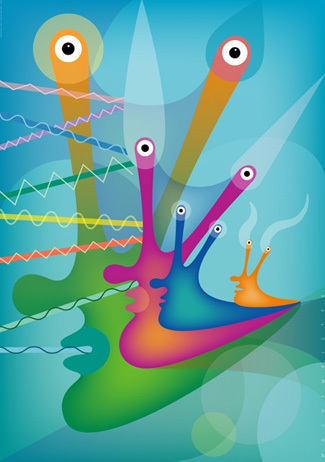 May I add that I am very impressed with your art work, and am thrilled you have created this digital art forum – Art Digital Magazine. Also, I have read your guide to collecting digital art, Collecting Digital Prints. It is brilliant. Digital art and artists have needed this kind of enlightened support for a long time. I am grateful it is you, a talented artist yourself; who is spearheading this venture. Max: Well, you’re very kind to say those things. 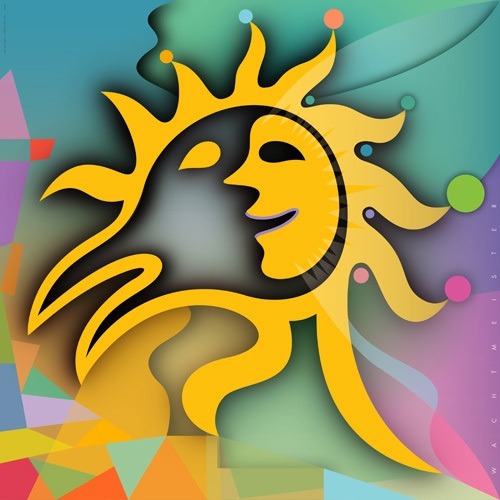 Though there are others doing a commendable job at educating the public about the joy, process and profit of creating and collecting digital art…like the people at SIGGRAPH and like Larry Richards, the founder of Common Grounds. Speaking of which, If I recall, you were selected as one of the artist chosen by the panel of curators to be featured there. Is that correct? Max: Excellent. Yes, my work is also in that same series, but I have to say that all the work on that site is great – very professional. Larry and his associates have done an incredible job. So, how long have you been an artist? Scott: I feel I was born an artist. My parents recognized my artistic abilities at a very early age. I was fortunate they were able and willing to begin my formal training very young. I will always be grateful they were willing to make personal sacrifices so I might always continue my artistic education. Aside from University, I was most influenced by my education at Interlochen (Interlochen MI), where I studied both Art and Drama. Max: Why art – what compels you to pursue this career over another? Scott: Well, it certainly isn’t for the money! Pursuing art was a natural decision. No other career was ever an option. I don’t mean to mislead. I have always had other careers to insure a paycheck. Those careers have always been creative in nature. It would be optimum to be able to make a living strictly doing art, and that has always been a goal. I was able to manage this for the last 3 years, but something happened. I am blaming it on the economy. Sales began to slow, and now I am scrambling to find a (creative) job to pay the bills. Art as a career will always be a wild ride! Yet, no matter how unpredictable an art career may be, I can’t fathom doing anything else. Because of my present situation, my heart goes out to all Americans who are currently struggling to keep their lives on track. Sadly, many who never suspected will soon become members of this struggling class. God bless our new President (Barak Obama). Thank God he is our new President. Max: Sure, sure…a lot to consider. As well, I suspect others can indentify. So, would you tell me now, who are some of your favorite artist? 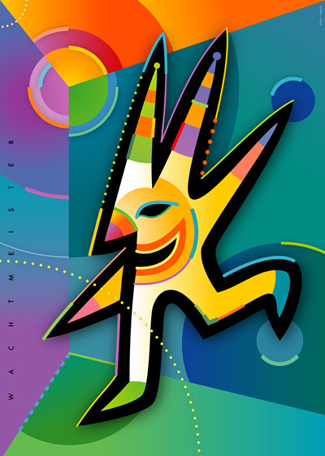 Gaudi, Frank Gehry, Escher, Calder The DaDa period, the Eames boys and the 50’s West [atomic-modernist] Coast style. Max: Wow, your range in taste helps to explain the dynamism expressed in your own work. Yes, and Calder has to be one of my favorites as well. So, have you heard of the TADAE creative subset; if so, any thoughts about it? Max: Agreed, and too this, how would your describe your work? Scott: Maybe the best way to describe my art would be to describe the process. I rarely create without being called to create. It doesn’t work for me to just sit down and start creating without “feeling it”. I always begin with an urge to start. I often drop what I am doing when I get this urge. I have been out with friends and left them, the creative urge was so strong. I also know when I am done with a piece. The urge subsides. This mind set is like a transcendental state. In other words, all the while I work, it is almost trance like. I feel good, centered and focused when I am in this mood, and don’t have to think much while I am riding the creative wave. Whatever I do works. It’s almost as if I am channeling from another place. It is truly a magnificent experience. Scott: Yes, I usually have ideas already in my head to start. I store them there when I am between creative urges. These ideas range from colors I want to use, shapes I want to use, or a feeling I want to express. I rarely end with a result that was born from these stored ideas. So in that sense, it is context from chaos. It’s getting a version of the original idea down, and allowing the discovery process to take that idea to a finished image. Basically I want to end user to look at my work, and have it speak to them long and hard enough to stop any negative speech they have going on their heads. If my imagery is strong enough to break the repetition of negative thought in the onlooker, then perhaps I have given them a chance to begin to flow positive energy out to the universe. This can only be good for us all. Did I answer the question? Max: Perfectly. You express yourself beautifully, and I imagine you might make a wonderful stream-of-consciousness poet…reminiscent of the beat generation. And now here’s a question for you, something that I think every serious-minded artist will have to contend with one time or another; the commercial gallery. How have you fared in that respect? Scott: Commercial galleries still make me feel as if I am a pariah. I have given up trying to show in them. One can’t get much past the front door when you mention digital art. I have done very well in contemporary furniture showrooms. Until a commercial gallery approaches me, I will remain an outcast. I can’t continue to subject myself to their kind of rejection. Max: Fair enough, and yet the maturity of your work seems to have flourished in spite of the walls of resistance you have encountered. Still, I imagine that you must still have some specific career goals, not already achieved? Scott: In all honesty, my true artistic goal is to somehow make a positive difference in the world. I feel this is my artistic destiny, but am not sure how it will transpire. It would be optimum to become so wildly wealthy from my art, that I could practice philanthropy with reckless abandon. Still, I shall remain open; listening for direction being whispered from the corners. I believe I will make a difference artistically. Maybe I already have. Max: Absolutely, you most certainly have. Your art is certainly a positive inspiration to me and now that I’ve had the chance to chat with you, I can say that your intellectual extrapolations have had the same impact….a very positive impact. And finally, I have just one more question. Looking ahead, how do you perceive the future of art, digital or otherwise? Scott: I certainly believe that digital art will have (already has had) an influence on traditional art in the respect that art is influenced by its environment. Digital art is here to stay. There is no turning back. It is only a matter of time before it is recognized by the art majority as a legitimate art medium. I can’t think of anything more exciting than the prospects for the future of the digital medium. Max: I couldn’t have said it better. Well said, and again I sincerely appreciate you making the time to do this interview.